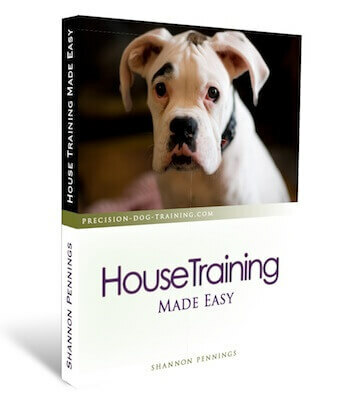 Dog Training - For Dummies? Feel like you're in over your head with this new puppy and his new bad habits? Needing physio for your shoulder after being walked around the block by your 80 lb Lab? Or perhaps your dog's love of tunneling in the backyard has to come to an end? You’ve just bought the most adorable puppy, and while he’s cute, I’ll bet he’s definitely proving to be a handful! Up at all hours of the night for whining and potty-duty, barking, chewing your favorite leather shoes to shreds… and as he’s getting bigger, so are the problems. This is worse than a baby! Or maybe you’ve had Rover for a few years already, and she is the owner of the home, wreaking havoc in your life. You’ve decided that enough is enough! You’re going to find a solution to her nipping, pulling you down the road on her leash, jumping up and growling if it’s the last thing you do. Never fear - there IS an answer to your problems. And why can you trust me with your dog's misdemeanors? Justice used to be a certified master escape artist who loved to run away. Now she hangs around home like she's supposed to, and comes when I call her. However, you're the only one who can decide if this is worth it... I like to let the results speak for themselves. Welcome to Precision K9! I'm excited to spend some time with you here, showing you the ins and outs of training the family dog. With information over-load these days, it's hard to know who to trust. After all, this is a family member we're talking about! True, the odors that she emits sometimes are enough to make even the toughest guy cry, and there are a few embarrassing habits like goosing your Aunt Gwen. Oh horrors. Well, all we need is love, right? Wrong! Wrong, wrong, wrong. Believe me, it's a whole lot easier to love your dog when she's well-behaved, too! Ergo, dog training. Dog training is one of the smartest investments you will ever make! If you’re reading this, either that bubble about owning a dog being all roses was already popped a long time ago, or you are thinking ahead and want to avoid the common pitfalls of raising a puppy. If so, kudos to you! You’re taking a step in the right direction. 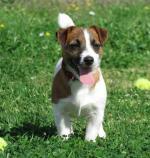 Dog obedience training will be the number one factor in turning around or preventing unwanted behavior. You will only get out of a dog training class, or any training at home, what you put into it! Why settle for Rover taking you for a walk and catering to her whims, when you can easily train her to follow you and your schedule? Even if you’re not interested in turning her into a show dog, the peace of mind from knowing your dog is under control in any situation is enough reason to do so. After working at a dog kennel for a couple years in high school (and owning dogs all my life), I knew that I wanted to be able to help owners with the problems they faced in training. I wrote this website specifically for you (and for your dog, of course!). A dog should be an enjoyable member of the family, not a terror. 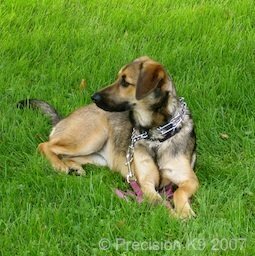 So this site gives my best professional advice on how to solve common behavior problems, obedience training tips and techniques, dog and puppy care "need-to-know", and other types of training I'm passionate about (anyone heard of narcotic detection?). This is just a sprinkling of what you'll find here! To keep up to date, subscribe to our RSS feed by clicking in the box below the navigation bar to the left of this page. And to help you along the way, why not sign up for the free monthly e-zine, The Yellow Hydrant? Written exclusively for our subscribers, it will give you valuable dog tips, articles, and discounts on new e-book releases delivered right to your inbox! Proper dog obedience training and common sense will make those annoying behavioral problems a thing of the past - and it doesn't have to be expensive, either. Let me lead you on the journey towards a happy, natural relationship with your dog, and have some fun along the way!